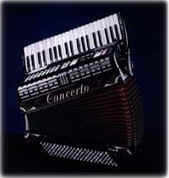 Concerto, designed and made in the USA, sets new standards and brings to the World the first Digital/Acoustic accordion featuring easy plug and play technology and is fully General MIDI and GS compliant. Such wonders as optical sensing of the treble keyboard and transducer sensing of the bellows allows accurate touch sensitivity and bellow expression control. Add this to features like Phantom, Dynamic MIDI Expression Pedal, Extended Bass Range & Chord Arpeggios (freeing the fixed positions of the left hand), and you will soon discover why there is no competition! Concerto, a complete MIDI system, eliminates the many frustrations of other MIDI accordions yet its powerful GS controller offers professional control of sounds and digital effects directly from the grill. Concerto puts you in control with the power to layer six sounds, easily recall and memorize over 350 on board CD quality sounds, plus digital effects! 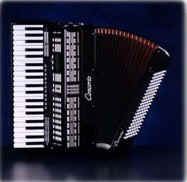 Married to a superior acoustic accordion featuring quality (all wood) Italian craftsmanship including 4 and 5 sets of Hand Made Reeds (also available in tone chamber). Concerto, designed by a team of musicians, and engineers is easy to use and is at home no matter the musical style or musical ability! Concerto makes playing simple and fun with its unique grill design and generous use of displays (large display in front and small one on top) makes playing Concerto simple and fun. The sections for the left hand Bass, Chord 1 and Chord 2 (see display/left bottom 3 rows) allow the layering of 3 sounds in the left hand. The sections for the right hand Solo, Orchestra 1 and Orchestra 2 (see display/right bottom 3 rows) allow the layering of 3 sounds in the right hand. Concerto features 8 Factory Registers (each a professional registration of sounds & settings for both hands). These Factory Registers allow you to proudly play Concerto from the very first moment you put it on (no need to learn about computer programming). The tone buttons, logically laid out in musical families such as Pianos, Organs, Guitars, etc. can easily be assigned to any of the six musical sections making CONCERTO versatile and easy to use. Concerto allows you to select and memorize all functions (volume, reverb, octave, repeat, pedals, bellows, and other settings) with the aid of easy to use Menus. Concerto also features a LIBRARY MENU, with over 350 sounds in alphabetical order, simply press a sections UP or DOWN key and watch the sounds roll by, stop on the sound you want and you've got it! Selecting sounds on Concerto is FUN! Once you have made all your selections, you may store the sounds and settings as a "user register" which can be recalled instantly with the touch of one button (8 Register buttons per 16 SONG buttons). Concerto has memory for 128 USER REGISTERS built in plus, with optional RAM Memory cards, the sky is the limit. Concerto includes accordion, deluxe carry case, portable sound generator (rack mountable), pedals, UL & CSA approved power supply, instruction manual with video. See and hear the excitement for yourself. Below, please find some further technical features. Master Tune _ master reverb _ master chorus settings!